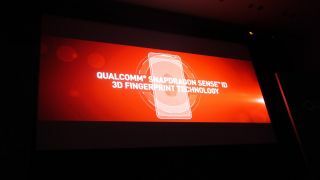 Qualcomm has announced its new Snapdragon Sense ID 3D Fingerprint Technology at MWC 2015, taking digit scanning on your mobile device to the next level. Expected to hit phones and tablets in the second half of 2015, the new technology uses 3D ultrasonic imaging which builds a detailed 3D map of your fingerprint with detection of sweat glands and ridges in your finger. This makes it not only more secure than the capacitive options on current handsets, it's also more accurate. A big advantage of the ultrasonic technology is it's able to read your fingerprint through glass, metal and other materials, opening up a range of design options for manufacturers. That means rumours we've seen suggesting the likes of Apple are looking into embedding a fingerprint scanner beneath the phone's display is now possible. The technology also doesn't suffer from reading issues if your fingers are greasy or covered in lotion, again improving the accuracy and performance of the scanner. Sense ID isn't a feature reserved for flagship devices, with Qualcomm confirming the technology can be rolled out across its portfolio of chipsets - from the high-end to the low-end.